It had been a long time since Francis saw Catherine. He had gathered that their was another man involved that didn't bother him as much. Francis was a free man he could offer Catherine the world, as far as he was concerned. With a candle reflecting of the walls, he asked Catherine to come to the door. I'd been laying in bed, dreaming of what it would be like to be at court, when I heard a knocking and Dereham's voice. Carrying a taper to the door I opened it, checking quickly to ensure there was no one else passing through the hall. "What are you doing here, Francis?" My tone was not sharp but curious. I even wondered if I should invite him in. It had been a few weeks since I had written to ask of me and Kitty could go to court. Now, in my hands was a letter from the duke of norkolk I could still smell the freshly penned ink on the paper. Kitty Kitty! We have had a reply from court. I had been looking at an illustrated book of the lives of the saints, when my sister entered announcing the good news. I jumped from my seat as my heart jumped into my throat. "What does it say?" I asked, though the look on her face was enough to tell me. Taking a knife I sliced through the hardened wax that held the letter together. I could not believe what I read oh, Kitty and I was now going places. We are going to France! I shrieked as I held out the letter to show Kitty what was written. "France!" I exclaimed. "This is such amazing news! When do we leave?" My eye's skimmed the letter reading all the important parts. 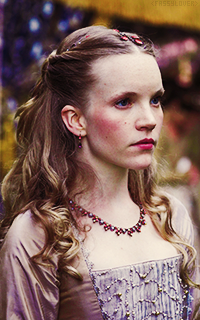 I would go anywhere to with Catherine and protect her from any schemes the Boleyns had in store. We are to leave at once! where we shall be expected to arrive in the great hall for a feast in which both kings shall greet each other. After that is over we are free to explore France at our pleasure. My heart felt as if it grew wings! Sailing to France, where both Henry VIII and François I would be! I squealed in delight and fiercely hugged Izzy. "I promise, I will be on my best behavior! Everyone shall find me to be the epitome of a courtly young lady." Catherine sat gazing outside at the falling leaves tumbling down outside. She wondered where Francis and Henry were hiding they had not paid court to her in ages!